How to sell Kotex page for trade publications, probably early 1920s, U.S.A.
"Sales and Profits are FLYING HIGH with TAMPAX tampons"
(aimed at dealers? ), 1967, U.S.A.
Look how the ad combines the tradionally feminine cheerleading with the traditonal masculine piloting of an airplane. See more ads involving cheeleaders: New Freedom pads, Pursettes tampons (cheerleader drops her tampon and shames herself), Stayfree mini-pads. 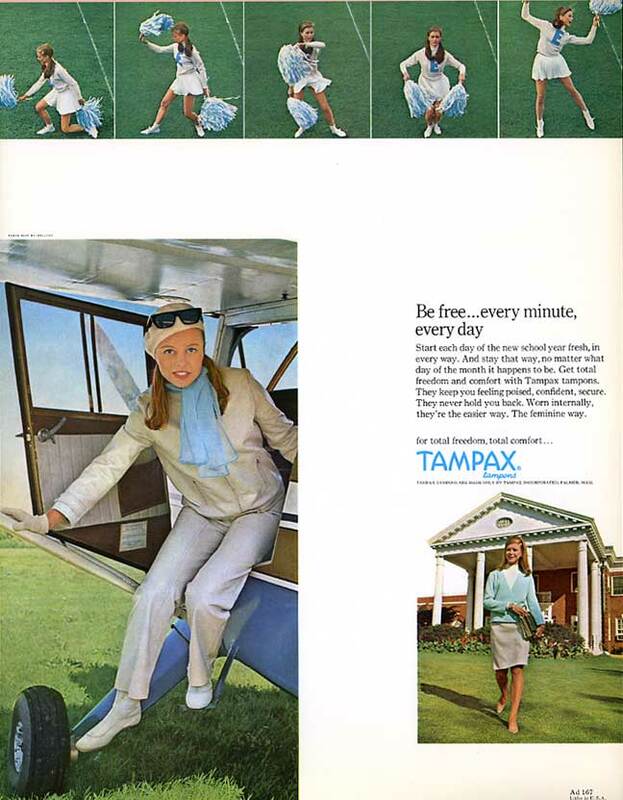 Menstruation ads involving airplanes are hard to find - but you will later in this series. MORE in column at left. I thank Tambrands, the former maker of Tampax, for generously donating this folder! measures 10 1/8 x 13 5/8" (25.7 x 34.6 cm). The tiny type under the photo at lower left reads PANTS SUIT BY MALLORY. NEXT: Discussion - Folder front Folder center: left right Folder back - Glossy ADS #: 167 168 169 170 171 172 173 - List (page 2) of places the ads will appear || See the advertising folders for 1963 (with 6 ads), 1964 (with 8 ads) & 1966 (with 7 ads). || How to sell Kotex page for trade publications, probably early 1920s, U.S.A. - "Your Image is Your Fortune!," Modess sales-hints booklet for stores, 1967 (U.S.A.) - "Your 'Keys' to More Profits," Kotex brochure for retailers. 1960s. (U.S.A.) - First Tampax? & first tampon with applicator (1931-33? ): box, tampon, instructions, plus newspaper ad from 1934 - Tiffany bowl celebrating the 50th anniversary of Tampax - 1936: box, tampon, patent (with a short account of the invention of Tampax by Dr. Earle Haas, and of the first Tampax president, German immigrant Gertrude Tenderich) - Teachers' guides - Menstrual educational booklets for girls & parents. See the promotional folder for the next year, 1964.
this Web site in any manner or medium without written permission of the author.